I think we should send a newsletter about the first Writers Weekend tomorrow and publish a call on our blog. I created a text for this. If one of the native speakers got some time pls. correct the language. Feedback welcome. Do you have an interesting project or idea, or have knowledge that helps people across the globe to get on the road and experiment, play with or implement a circular economy solution? But you never found the time to document it and share properly and start the collaboration. Join us for our 48 hour documentation jam! The weekend will be an experiment on how we can capture and share all the knowledge that we have built together so far. We will connect through various channels (chat and video) to share ideas, results, progress and to support each other. All of the contributions will be promoted throughout the OSCEdays community – for example to inspire local event organizers for their local events during the 2017 global OSCEdays event. Join us. Start to document > connect > collaborate. Here is the full program of the weekend. I added the forum and video channels: do you want to keep it and add links? Also, maybe it needs a sentence explaining what the added value / higher purpose of the activity is? Or, what you gain by participating? 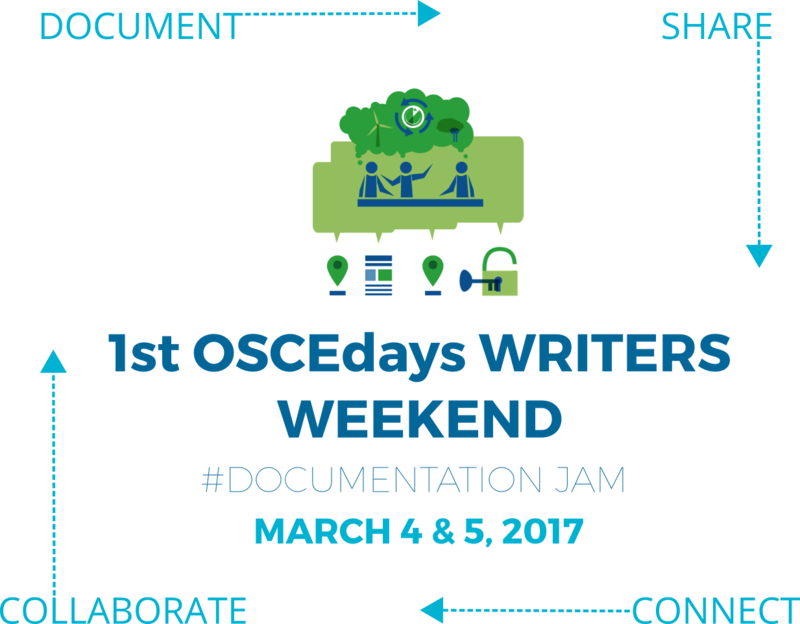 Nos complace invitarlos al primer OSCEdays Writers Weekend. Este es un evento colaborativo de dos días dedicado a documentar soluciones de economía circular. Tienes un proyecto o idea interesante, o tienes algún conocimiento que ayude a gente alrededor del planeta para ponerlo a funcionar y experimentar, jugar con él o implementarlo como una solución de economía circular? Pero nunca has encontrado el tiempo para implementarlo y compartirlo de manera apropiada y de iniciar una colaboración?, únete a nuestras 48 horas de documentación! En este fin de semana vamos a experimentar en cómo podemos capturar y compartir todo el conocimiento que hemos construido juntos hasta ahora. Nos conectaremos a través de varios canales (chat y video) para compartir ideas, resultados, progresos y ayudarnos entre todos. Todas las contribuciones serán promovidas a través de la comunidad OSCEdays –por ejemplo para inspirar a organizadores de eventos locales para sus propios eventos durante el Evento global OSCEdays 2017. Únete. Empieza por documentar>conectar> colaborar. Aquí puedes encontrar el programa completo del fin de semana.